I adore ice dance & mens, but don’t follow these disciplines as closely as pairs & ladies. So instead of doing full reviews, here’s a post with my own personal highlights from these events! Piper/Paul were definitely my favorite couple in the dance event. I absolutely love their programs this season and find them so innovative. The music selections are unusual, and the choreography is intriguing. I know that some people feel their programs border on the bizarre, but I really enjoyed them at Skate America. One thing that makes Piper/Paul’s programs work so well is they appear very well trained and prepared this season. Watching them on practice and in the competition, they looked very secure in all their steps, lifts, and partnering and had very good flow over the ice. I didn’t see any slips, mistakes, or bobbles. Their odd, quirky programs work because of Piper/Paul’s solid execution. Another thing I noticed, seeing Piper/Paul live, is how well matched they are physically. They have similar builds and a great height differential for dance (not too much or too little). And their contrasting coloring is striking. They just look good together. I think they are well matched in terms of personality as well. Paul has such strong partnering skills, but it’s Piper who really sells their programs and choreography with her exuberant personality. I was disappointed to see Piper/Paul place only third. I’d have liked to see them higher. Their total score of 157.58 was well off their personal best of 165.22, set last year at Worlds. I can’t speak to their technical levels, but I’d like to see their PCS much higher, particularly in the FD. Hopefully their scores will improve over the season. For now, they’re a great pleasure to watch for any audience lucky enough to see them! I quite enjoyed Sinitsina/Katsalpov’s Swan Lake SD. This is a traditional waltz that works. I thought their movement fully captured the sweeping, joyful feel of the waltz, and the dance was lively and light, rather than staid. Viktoria’s white tulle dress and Nikita’s white-ruffled shirt matched the theme nicely. This couple seems to be gelling, after a slow start last season. They look more like a team this year. Watching them on practice, I was most impressed with Nikita’s skating skills. His flow over the ice is very smooth and his knees are soft. Anastasia/Colin’s Beethoven FD was one of my favorite dances at the event. They express this music so well, the program goes by very quickly, and there is much joy and passion in their dancing. It was just a lot of fun to watch. Anastasia/Colin placed a solid 5th. They scored well with their FD, but were held back a little bit by their SD. 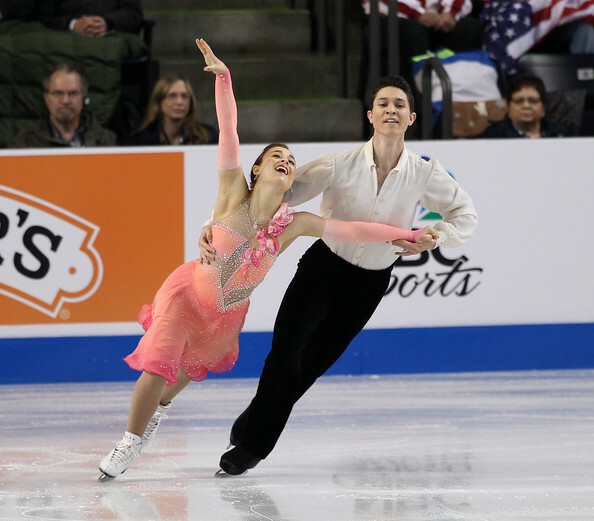 Hopefully we’ll see them in another competition before U.S. Nationals. I really like Baz Luhrmann’s surreal, fantastic film version of The Great Gatsby, as well as the score from the movie, so I quite enjoyed Yanovskaya/Mozgov’s FD to this music. I thought they did well capturing the decadent romantic glamor of the move. Their costumes reflected the theme well, too, especially Anna’s. This young Russian couple placed 6th. Just up from juniors, their look is not as polished and developed as the top teams. But I enjoyed them. Wang/Liu’s Crouching Tiger, Hidden Dragon FD was a nice surprise. We don’t often get to see Asian-themed programs in ice dance, so I really enjoyed this number. There’s a lot of cool lifts and transitional moves that use Wang/Liu’s significant height differential to good advantage. The costumes were great, and the program was crowd-pleasing. A good package for them. What a gift it was to see this young man at Skate America. He is truly special; one of the biggest talents I’ve seen. His long program was thrilling. The whole program went by so fast, and the last third amazed me. When he hit the quad/double combination, the crowd started to go wild, and it just built from there. The cantilever into his final spin was so cool, and the crowd was on its feet even before he finished. Wonderful. As I said to a friend, these are the moments you live for as a skating fan—the moments that just sweep you away and remind you why you love this sport. 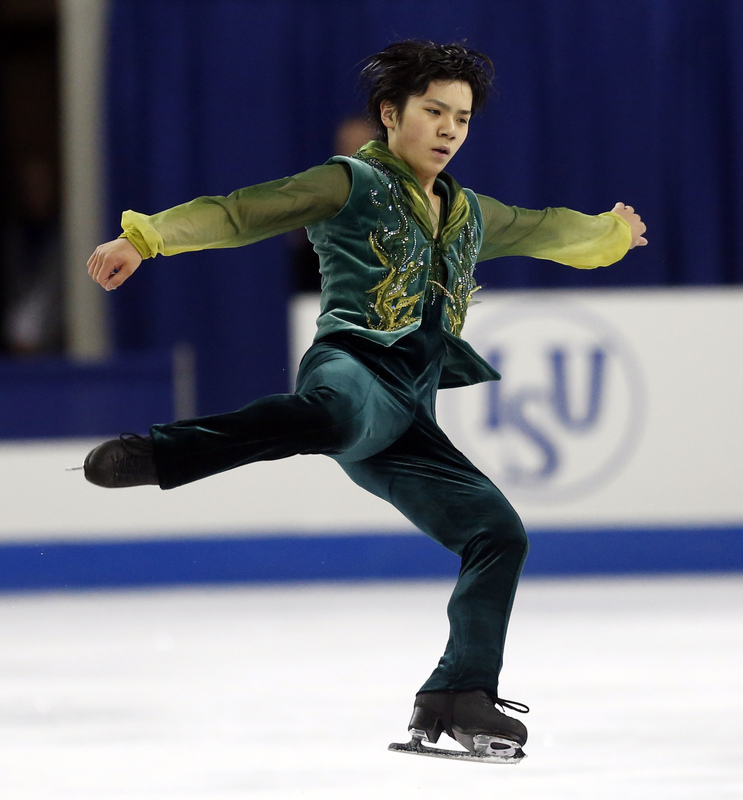 I love almost everything about Shoma’s skating—the softness of his knees, his gorgeous jumps, his commitment to his choreography, his flair, his daring, spontaneous quality on the ice. Even his costumes get an A+, as far as I’m concerned. I already can’t wait to see more of this young man. Max deservedly won the event with 2 very good programs. I was so happy to see him landing his jumps with ease and flow here, and his speed is very good. He really is doing a much better job carrying his performance through the whole program, not just doing moves here & there between jumps. He is a far more complete skater these days than when he won his national title. Max celebrates his victory in the kiss-n-cry! I quite enjoyed Max’s Black Swan LP; the program suits him surprisingly well. My favorite moment is when he flaps his “wings” toward the end. 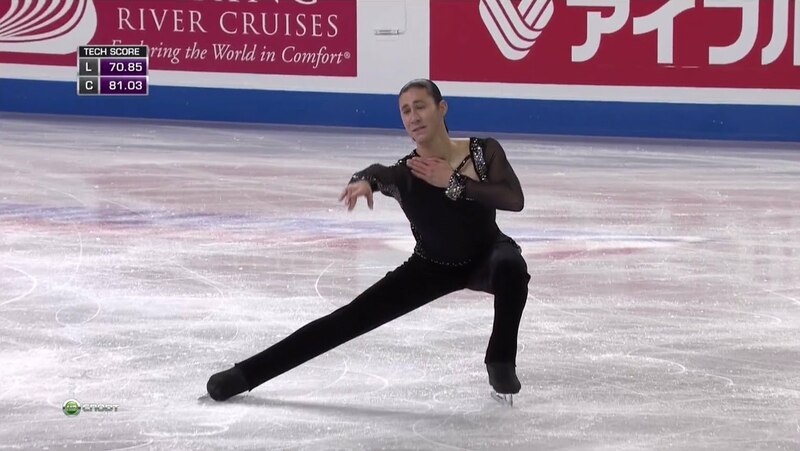 Instead of the usual refined flapping you see in Swan Lake programs, Max moves his arms up and down in a stiff, purposeful, masculine way that’s very effective and a real highlight. Fun to watch, and a great victory for him. 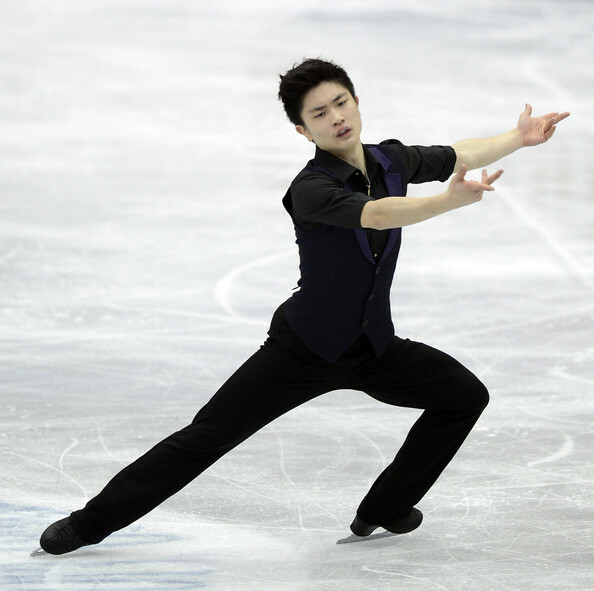 I loved seeing Han Yan on practice and in the SP. His skating skills are so strong and gorgeous. I love watching him enter his jumps with so much speed. It makes the jumps look fantastic. His short program was quite good. Unfortunately, Yan once again had a very disappointing LP with many mistakes. It’s such a shame. He has tremendous potential as a skater–I hate seeing him flop like this. Jason had a decent outing at Skate America to win the bronze. Are the programs too complex? I like his programs this season, especially The Piano LP. But I worry the choreography is just too complex and intricate and does not allow Jason to build sufficient speed and flow for his jumps. Seeing him live, the difference in speed/power between Jason and skaters like Shoma, Max, and Han was unfortunately quite apparent. Unless things improve significantly in his next Grand Prix, I’d like to see Kori/Rohene dial back the complexity of the choreo a bit before Nationals. I love the programs, but the bottom line is, Jason has to be able to build enough power for the jumps.